A variety of apartments in a new residential complex in the attractive neighborhood of Plovdiv - "Recreation and culture". The green space of maintained parks, the Mall of Plovdiv and one of the seven hills of the town are within easy reach from the complex. The area is awash with schools, children's centers, playgrounds and a prestigious kindergarten. The Rowing Base, tennis courts, bicycle alleys and football pitches can be found within 10 minutes' walking distance from the property. Various one-bedroom, two-bedroom, three-bedroom and four-bedroom apartments are offered for sale. The apartments are spacious and bright, with high ceilings (2.85 m) and functional layouts. The residences offer views of the inner garden, the nearby park and the hill. The apartments are offered unfurnished and can be furnished according to the taste and budget of future owners. The apartments are located on 7 residential floors. On the ground and basement floors - garages and parking spaces can be found. There are 117 parking spaces and 7 parking spaces for people with disabilities. On the ground floor there will be 36 single and double garages for a total of 57 cars with adjacent service rooms to them. Parking spaces for electromobiles are also designed. There will be bicycle stands on the ground and basement levels. The interior of the complex follows aesthetics and quality in every element to ensure luxury, comfort and coziness. The decorated HPL facades, designed in light, earth colors, give an elegant finish. The interior of the common parts relies on clean and straight geometric forms and modern design solutions. The complex offers various types of spacious and functional apartments with excellent layouts. The premises guarantee spaciousness, with bright height of the dwellings - 2.85 m. The southeastern sides of the buildings have extensive terraces revealing fascinating views of the iconic Youth Hill and the Rhodope Mountain. The northern part overlooks the park "Recreation and Culture", offering an incredible sense of closeness to nature within the big city. 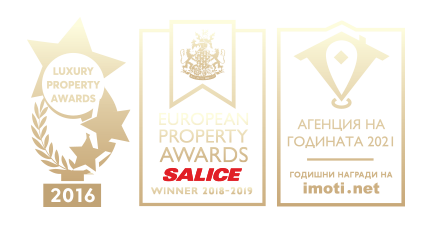 The Developer has impressive, successfully implemented residential projects in Bulgarian cities and resorts on the Black Sea coast. The company's projects are characterized by modern architecture and design, spacious functional units, well-developed infrastructure and quality construction.